Background: Poly(d,l-lactide-co-glycolide) (PLGA) based biodegradable nanoparticles are of key interest for the development of controlled release drug delivery systems and for other biomedical applications. It has been reported that PLGA polymers can be converted into colloidal nanoparticulate systems by various techniques, such as emulsification-diffusion, emulsificationevaporation, interfacial deposition, salting out, dialysis and nanoprecipitation. Emulsificationevaporation with water immiscible solvents including dichloromethane and chloroform has been the preferred method for the synthesis of PLGA nanoparticles due to the low boiling point and limited water solubility of these solvents. We and others, however, have found that when water-immiscible solvents are used for the synthesis of PLGA nanoparticles, particle aggregation, non-uniform particle size and multimodal size distribution are commonly encountered problems. This suggests that the synthesis of PLGA nanoparticles using water immiscible solvents is highly sensitive to small procedural variations that affect overall reproducibility. Objective: This study presents a simple and robust procedure for the preparation of PLGA nanoparticles with very small batch to batch variability (<5% variability in size (z-average) as determined by dynamic light scattering). Results: The results showed that the emulsification solvent diffusion method teamed with partially water-miscible solvents, such as ethyl acetate, is a versatile approach for the preparation of PLGA nanoparticles with highly reproducible sizes (between 50 and 400 nm) and zeta potentials (between - 30 and +30 mV), with relatively narrow polydispersity. Conclusion: Emulsification-diffusion with ethyl acetate is, therefore, a more reliable alternative to several existing procedures for the reproducible and refined synthesis of PLGA nanoparticles. Keywords: PLGA, nanoparticles, drug delivery, ethyl acetate, emulsion, solvent diffusion. Keywords:PLGA, nanoparticles, drug delivery, ethyl acetate, emulsion, solvent diffusion. Abstract:Background: Poly(d,l-lactide-co-glycolide) (PLGA) based biodegradable nanoparticles are of key interest for the development of controlled release drug delivery systems and for other biomedical applications. It has been reported that PLGA polymers can be converted into colloidal nanoparticulate systems by various techniques, such as emulsification-diffusion, emulsificationevaporation, interfacial deposition, salting out, dialysis and nanoprecipitation. 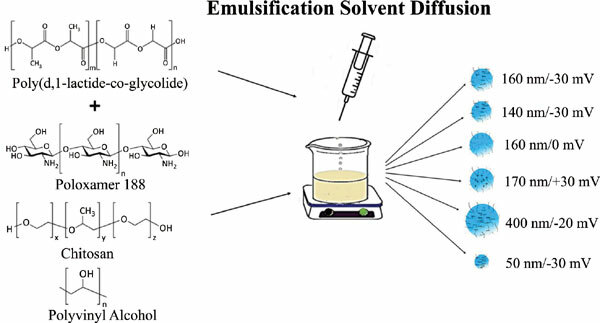 Emulsificationevaporation with water immiscible solvents including dichloromethane and chloroform has been the preferred method for the synthesis of PLGA nanoparticles due to the low boiling point and limited water solubility of these solvents. We and others, however, have found that when water-immiscible solvents are used for the synthesis of PLGA nanoparticles, particle aggregation, non-uniform particle size and multimodal size distribution are commonly encountered problems. This suggests that the synthesis of PLGA nanoparticles using water immiscible solvents is highly sensitive to small procedural variations that affect overall reproducibility.